By starting your sweet corn seed off early you can bring your first cob to maturity 4-6 weeks sooner that you could otherwise have expected. All you need to do is to sow them under protection - and germinating sweet corn seed indoors is perhaps the best and easiest way to achieve this. In northern European climates perhaps the earliest you would want to start would be the end of March. However, unlike most other vegetable crops, sweet corn are wind pollinated and are best planted in large blocks where the male flowers at the top of the plant have more opportunity to shed their pollen on the female tassels below. 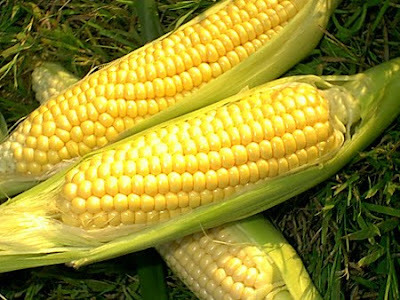 Therefore, the absolute minimum number of sweet corn plants you would need to grow for effective pollination is 5. These will also need to be planted in the shape of a square – one in each corner with the 5th one in the middle. However, for effective pollination you would need to consider planting at least a dozen – preferably more. To begin with, fill a 3 inch pots with compost and make a 1 inch deep hole in the top of it with a dibber (a pencil will do if you don't have one), then drop two seeds into the hole. Back fill with compost and water in, then cover the pot with a clear cover such as a sheet of glass or Perspex – even a piece of cling-film will do the trick. When completed, relocate you pots to a warm and sunny windowsill, leaving them to germinate. 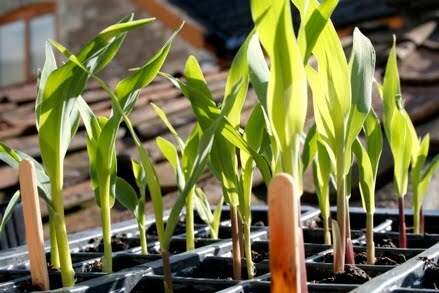 Once the new seedlings begin to emerge remove the clear cover, then when seedlings are about 2 cm tall discard the weakest one. Water regularly, but do not over water or allow the compost to completely dry out. If the seedlings are in full sun consider turning the pot a quarter turn on a daily basis to prevent your seedlings from acquiring a 'permanent' lean. Once the threat of late frosts are over, move the plants in a shady place outdoors to harden off before planting out into their permanent position. HOW CAN YOU TELL WHEN SWEET CORN IS READY TO HARVEST? HOW AND WHAT DO WORMS EAT? CAN YOU KEEP HONEY BEES IN THE GARDEN? HOW DO YOU PLANT OUT ONION SEEDLINGS? HOW DO YOU HARDEN OFF SEEDLINGS?